Everyone who has seen a scary movie knows there are a few telltale signs of a classic haunting: mysterious bumps in the night, flickering lights, unpredictable cold spots. We’re all agreed in that using your life’s savings on an old farmhouse with a dark past is a bad idea, but there is another sinister haunting to be wary of. One that is much more common. One that occurs not at a full moon…but after a full rebrand. People are still struggling with your website. With the rebrand, you thought all your website woes were over! Your web team refreshed the template and now it has the new look and logo, but something’s still not quite right. The world of web design and UX changes fast! So fast that in just a few short years it’s possible your navigation has become cumbersome and outdated. Sometimes a simple website refresh is all the budget will allow, but taking the time to audit your site’s content and user experience while you’re already making big changes could have an added positive impact on how your new brand is perceived. Photography doesn’t tell your new story. The rebranding process is rooted in story. There was a good reason for your rebrand and especially if it’s tied to your company values, then you’ll want to share and protect that story as part of your brand identity. For example, if your new brand is all about authenticity but you’re using cheesy stock photos, or if your new focus is on people but there’s no human to be found in your website, case studies, or social media…then it’s time to review your photo library and see if this is an opportunity to realign your visuals with what you want to achieve with your new brand. Marketing was redesigned, but not reconsidered. Marketing is another area where a budget can play a major role in how far a rebrand can go. However, if your updated marketing has a fresh face, but is not making an impact, then it’s possible that staying the course has allowed your old marketing to get in the way of new opportunities. Maybe it’s time to ditch the trifold and try something new. Step back from the process of “re-skinning” past marketing pieces and take time to reassess the strategy behind them. Brand voice and messaging haven’t changed. Do you still hear the voices? 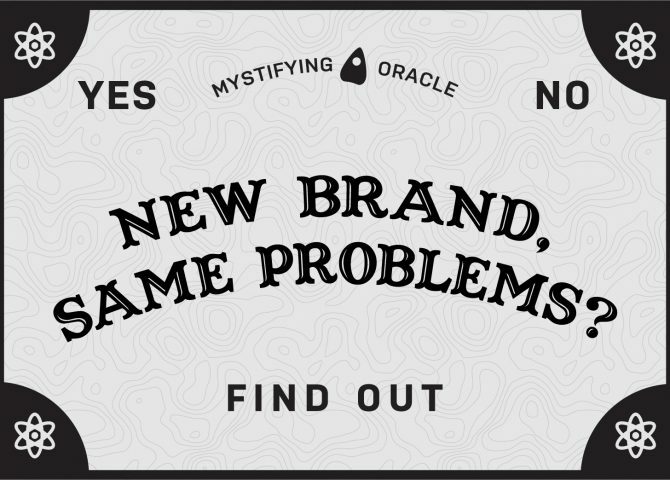 You’re not going crazy, you’re just hearing the voice of your old brand. When your look changed, you may or may not have refreshed the voice to go along with it. Either way, voice guidelines only go so far, and it’s easy to slide back into that past voice for copy and messaging. The way your brand communicates is as important as the way it’s presented. A bold and vibrant brand refresh should be accompanied by an equally energetic brand voice update. Beware a direct copy-paste from the past and remember your voice should align with both design and strategy. We all go a little mad sometimes. Don’t let the reason be your old brand that won’t move on.